To co-inside with the launch of the AW12 collection, Gola’s longstanding partnership with British design duo Tado will be celebrated with an exhibition of the eye-catching graphic landscapes, specifically created for the Gola x Tado collaboration, at the Boxpark in Shoreditch, London. The upstairs gallery area at Boxpark will be taken over by bright and vibrant artwork featuring the Gola x Tado gang on Thursday 6th September for a month. The exhibition features designs from the first collection and will showcase some new designs from the SS13 collection. The event will be launched with a party on Thursday 6th September with complimentary drinks from Havana Club Rum and some choice cuts and mixes from legendary DJ Boogie Blind! 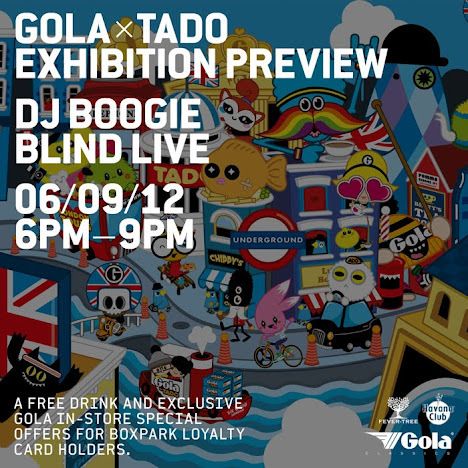 Boxpark loyalty card holders will benefit from additional in-store discount on all Gola x Tado merchandise on the evening of the event.